Click the chart for stock market data. Good riddance to this week. 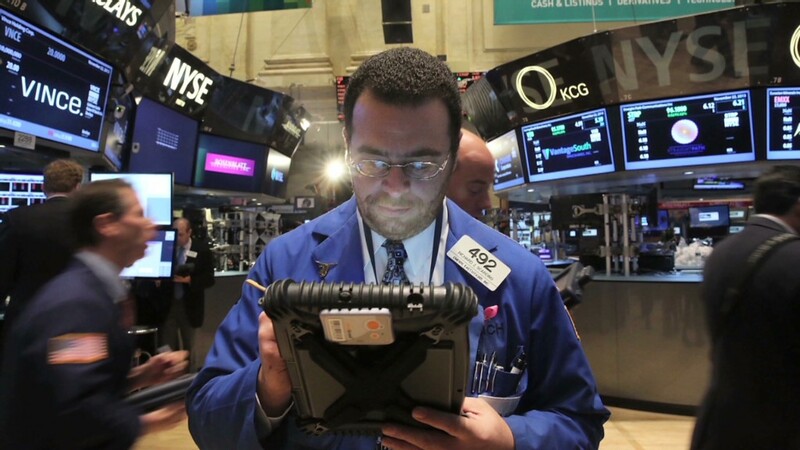 It was another ugly day on Wall Street -- and for markets around the globe. 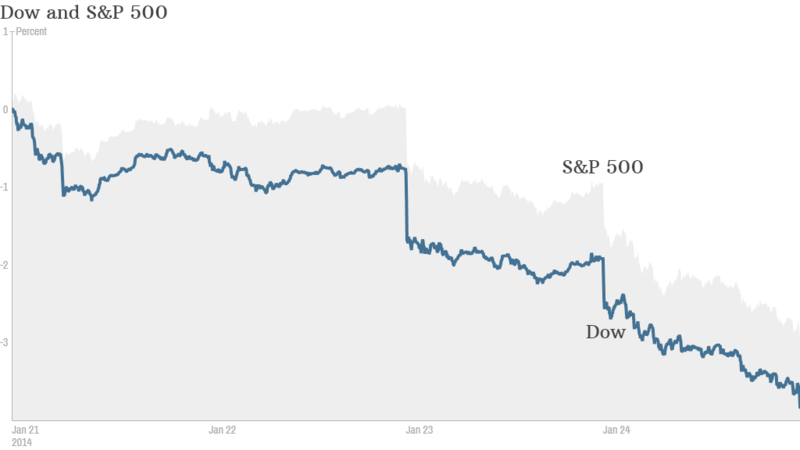 The Dow dropped nearly 320 points Friday, or almost 2%. The S&P 500 and Nasdaq fell more than 2%. CNNMoney's Tech 30 index also fell about 2%, despite a jump in shares of Microsoft (MSFT) following strong quarterly sales and earnings. The losses come at the end of the worst week for stocks in recent memory. The Dow tumbled more than 3.5%, its worst week since November 2011. The S&P 500 slid more than 2.6%, logging its biggest weekly decline since May 2012. Meanwhile, the Nasdaq tumbled almost 1.7%, its first weekly decline of the year and the worst since August. All three indexes are now in negative territory for the year. The selling has some investors bracing for a correction, usually defined as a decline of 10% or more. "$SPY If market doesn't bounce here, I imagine this will end up being a full 10% correction," said StockTwits trader kgpittm. StockTwits user Fundraising pointed out that he'd prefer a correction sooner rather than later so that stocks can resume their upward trend. "$SPY with how much correction talk out there I would rather have it now so it has more legs to run later Bullish," he said. Investors dump stocks around the world: Concerns about an economic slowdown in China pressured markets around the globe. Asian markets ended mixed after the HSBC survey showed that Chinese manufacturing activity slowed in January for the first time in six months and as a high-yield investment product from China's largest bank faces imminent default.. The Shanghai Composite did wind up notching a 0.6% gain, but markets in Hong Kong and Tokyo both dropped more than 1%. European markets closed sharply lower, with Germany's DAX and France's CAC 30 dropping more than 2% each. And emerging market currencies were also in sell-off mode. Argentina's peso has tumbled more 15% against the dollar over the past two days amid concerns over the country's foreign exchange reserves. Meanwhile, the Turkish lira fell to a record low for a ninth straight day against the dollar. The lira is down more than 8% this year. India's rupee also lost significant ground against the dollar. Earnings continue to disappoint: News from Corporate America wasn't helping either. After last year's big rally, investors are looking for signs the economy will be strong enough to keep the bull market going but so far, this earnings season has been decent, as opposed to spectacular. 102 S&P 500 companies have reported fourth-quarter results, with only 66 beating analysts' estimates, according to S&P Capital IQ. Of the remainder, 26 have missed, and 10 have met expectations. Xerox (XRX)shares took a dive after the copy machine company reported declines in quarterly revenue and profit. Honeywell (HON)shares were also down as the defense contractor reported a slip in quarterly sales. Procter & Gamble (PG) was one of the few bright spots in the market Friday. The stock rose nearly 2% after reporting quarterly profits that, while lower than a year ago, beat estimates. Starbucks (SBUX) shares were also rising after the coffee giant reported better-than-expected earnings. Natural gas jumps to almost 4-year high: As frigid temperatures continued to bite across many parts of the country, natural gas prices soared almost 10% above $5 per million British Thermal Unit, crossing the milestone for the first time since the summer of 2010. Many home across the country use natural gas as their man heating fuel. The ongoing surge in prices was a hot topic among traders, with many touting the United States Natural Gas (UNG) commodity ETF. "$UNG Burning through tomorrow's household fuel....TODAY!" quipped chumpville. "Look at Nat Gas go! #trendfollowing is loving this #polarvortex weather! $UNG" said attaincapital. But StockTwits trader LinvestResearch predicted there could be a pullback in prices soon and pointed to the VelocityShares 3x Inverse Natural Gas ETN (DGAZ), which goes down when natural gas prices go up. It plunged 17% Friday. "There will be correction after these gaps," she said. "#Natgas has reached multi-year highs. Profit taken soon $UNG $DGAZ."